I am going to warn you now. My favorite prop has become a student obsession! Last year as I was starting 1st grade’s unit on “le duele” in the second book ¿Qué comes? from ConversaBooks. I needed to review BODY PARTS. We had sung “Cabeza, hombros, piernas, pies”, “Chuchua” from Cantajuego, but I still wanted more repetitions in context. It just so happened that at the same time my 2 year old twins got “Mr Potato Heads” for their birthday. I was working with them to say all the body parts. Where is his nose? Does he have a big nose? Why is his ear on his head? …so I could use the same for my Spanish classroom. I was nervous the first day. Would they think I thought they were babies? Would they check out? I started with Señor Patata with no parts. I had all his body parts in a bag, and I proceeded to have each child pull the part out of the bag. (¿Qué hay en la bolsa? style) Thanks Carol Gaab and ConversaBooks for that great activity that never gets old. ***My favorite is when a student pulls out “the mouth”, and we decide how he feels by turning the mouth upside down or right side up. ¿Está contento? ¿Está triste? My first graders LOVED it and we did it for 3 class times in a row. It was the new PAT activity. Then I realized I could make more activities for it. 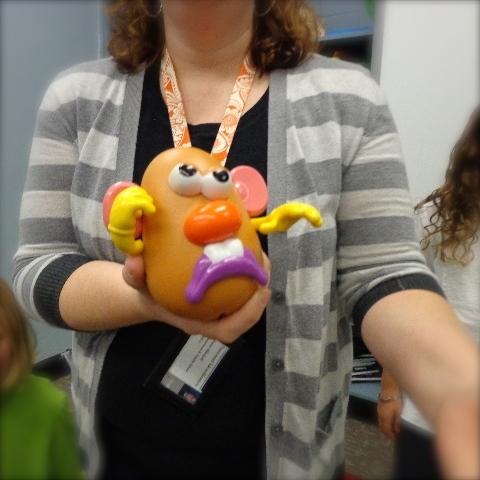 Then I took photos of Señor Patata, and we did reading, listening and writing activities. Now Señora Patata shows up in all my stories. The first picture that you see in the blog is from 5th grade where he shows up at the dump to look for legs. (Don’t worry. He uses bacon.) One group even had him fall in love with Barbie at the dump. He stays in my room on a shelf, and my students between classes will change him. I never notice until the next class comments. I even do this same activity with 8th grade on KINDERGARTEN Day. I have thought about adding a video from Toy Story or the Mr Potato Head commercials to get more repetitions. Who knows what Señor Patata will do next? That is why Señor Patata is my FAVORITE prop. What is yours? What gets your students excited? Next NTPRS – Top Take aways (4-5) Technology that is worth it!